Fixed-wing class 3 RPAS (Remotely Piloted Aircraft System) Zangão V relies on avionics and control systems for highly stable flights, even with minimum training operators. 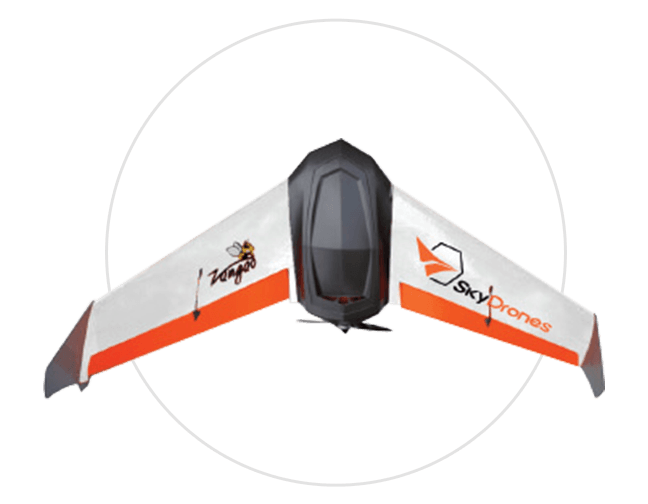 It offers a high payload capability and great reliability, with sensors that allow automated flights, covering pre-programmed areas without any pilot action. Differently from other models’ adaptations, Zangão V was conceived and developed since the beginning as a modular platform, able to carry several types of camera dedicated to mapping and timely corrections on precision agriculture systems. Weight: 2.2 kg (no batteries or camera). Depends on the payload and weather conditions. Cruise speed: 20-25 m/s (72-90 km/h). Radio link reach (line of sight): 5 km. Maximum takeoff weight: 3.3 kg. Altitude: up to 16,400 ft above sea level (ASL).